Copyright 2006 by Gary David. Although many cultures around the world have associated Taurus with the bull or wild ox, this zodiacal constellation was also universally connected with the concept of water. In fact, the Greek word Hyades (an open cluster representing the face or perhaps the horns of the bull) means "to rain." Farmers and mariners have always recognized this group of stars as a sign of coming storms and precipitation. Ovid calls them Sidus Hyantis, or "Rain-Bringing Stars." The Hyades --half-sisters of the Pleiades-- apparently were stricken with grief after their terrestrial brother, Hyas, drowned in a well; thus, their copious tears of mourning became rain. Consequently, the influence of Taurus is especially crucial in the desert where one’s survival is totally dependent upon the presence of this inconstant element. It is perhaps more than happenstance, then, that Aldebaran, the bloody bullseye of Taurus, has its specific Arizona correlation --as above, so below-- in the eponymous Grand Canyon Caverns. Located about twenty miles south of the canyon near the Hualapai Reservation, this dry limestone formation is completely devoid of life but rife with various types of crystals. It extends at least 210 feet underground (or as much as a 20 story building), though seismic testing has determined the existence of four lower levels, each larger than the one above with the lowest one still containing water and producing crystals. 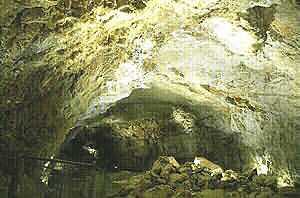 Findings have shown that the entire cavern system extends over 1700 feet below the surface. The deeper portion has yet to be explored, but the two main rooms in the upper portion of the caverns, the Chapel of the Ages and the Halls of Gold, are 130 yards long and 210 yards long respectively. 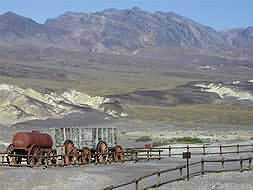 The latter room was so named because it was initially thought to contain rich deposits of gold ore, but the ruddy color (similar to that of Aldebaran) turned out to be merely iron oxide. In 1958 a passage was found with a mysterious source of air. Test smoke artificially produced in the passage eventually egressed almost fifty miles away near Huvasupai Falls in the Grand Canyon. After that experiment, the original name was changed from Dinosaur Caverns to Grand Canyon Caverns. The association between Taurus and caverns makes perfect sense if we remember the exquisite paintings of bulls found in the caves at Lascaux, France and Altamira, Spain. Near the entrance of the former complex is a naturalistic rendition of a bull, above which are suspended six dots. Some hypothesize that these represent the six visible stars of the Pleiades. If so, this would mean that Upper Paleolithic humans associated male bovines with the constellation Taurus about 16,500 years ago-- at least 12,000 years before the zodiac is thought to have been conceived! [BBC News (online), http://news.bbc.co.uk/1/hi/sci/tech/871930.stm] In addition, the bull-obsessed Minoan culture of Crete kept its bull monster, the Minotaur, inside the dark recesses of the Labyrinth, which reflects the twisting, intestine-like passages of cave systems. During Taurus’s midnight meridian passage*, the Hopi Two Horn Society directs the annual New Fire Ceremony that rekindles the creative fire of life and germination. One of the primary ritual articles of this society is the mongko, which is morphologically similar to Taurus. In physical terms the mongko is a flat piece of wood forked (or V-shaped) at one end, while the other end has been cut in the shape of terraced rain clouds. In the middle a "perfect ear of corn" (tsotsmingwu) is sometimes tied lengthwise. The mongko usually measures a foot to one-and-a-half feet long. From each end of the artifact are suspended two turkey feathers, and from the center hangs either a ball of earth in a cotton net or a reticulated water gourd-- emblematic of both sky and earth. The importance of this sacred "badge" should not be understated. "The supreme symbol of spiritual power and authority is the mongko.... It is the Hopi ‘law of laws.’" [Frank Waters, Book of the Hopi] A number of chief kachinas** customarily carry the mongko in their left (i.e. sacred) hands. One Hopi scholar asserts: "The mongko... symbolizes the father. The owner of this emblem stick relies on it for assistance and draws courage from it as he carries it about when he practices his ritual." [Ekkehart Malotki, Stories of Maasaw, A Hopi God] If we conceptualize both the mongko and the constellation Taurus not as a "V" but instead a "Y", we find an intriguing resonance on a microcosmic level with the male Y chromosome. The Hopi word for Aldebaran is Wuyok shóhü, or "Broad Star." Other meanings of the adjective wuyok include "large," "spreading," and "extending widely." All these could conceivably refer to either the dark grottoes of the unconscious or the Grand Canyon itself. The V-shaped symbol at the end of the mongko is a recurrent Anasazi (ancestral Hopi) glyph which means "opening up," an obvious reference to the sipapu, or small hole in the floor of a kiva (the Hopi semi-subterranean prayer chamber). The glyph may also represent the great Sipapuni of the Grand Canyon, the Place of Emergence from the previous Hopi Third World, or Era, to the present Fourth World. Wuyok also carries the connotation of being "old." One piece of evidence that supports this claim is the hieroglyph nu, meaning land in general or walled village or town in particular. The word is used to designate a place-name and the ideogram is formed by a cross within a circle. It is interesting to note that the Hopi word nu’ means "I" (first-person singular pronoun, i.e., one who stands at the center of the four directions), whereas the related Hopi word ngöla means "circle." The Egyptian noun nu generates a plethora of alternate meanings: "time" (the fourth dimension of space), "post on which a door turns" (a central axis allowing entry), "guardian" (an Enochian Watcher? ), "hunter" (as in Orion, the constellation adjacent to Taurus), "weapon" (used by Orion), "wickedness" (his violent propensity? ), "stall-fed oxen" (the domesticated version of Taurus), and "ibex" (another horned beast). In addition, Nu can refer to either the "Celestial waters" or the "deified primeval waters whence everything came." [E. A. Wallis Budge, An Egyptian Hieroglyphic Dictionary] (Again, "as above, so below.") Furthermore, the cognate nuh denotates "a cord, endowed with reason, used in measuring the estates of the blessed in the Tuat (the Underworld)." [Ibid.] Finally, the cognate nu-t refers to "the instrument with which Anubis ‘opened the mouth’ of the gods." [Ibid.] This last definition of the multipurpose nu as the adze-like artifact used in the opening of the mouth ceremony seen in the Book of the Dead adds a ritualistic aspect to its more pragmatic, geodetic one. One additional linguistic "coincidence": nu is the 13th letter of the Greek alphabet, which is shaped like a "V", the morphology of Taurus. As both traditional and alternative Egyptologists believe, the Khufu pyramid was built c.2500 BC during the last portion of the Age of Taurus. Most authorities (e.g., John Anthony West or Giorgio de Santillana and Hertha von Dechend) place the beginning of the Age of the Ram at 2000 BC. The esteemed astrologer Cyril Fagan contends that the era of Taurus started on the vernal equinox in April of 4152 BC and lasted until 1955 BC. [Astrological Origins] The end date is about five-and-a-half centuries after the Great Pyramid was built. Hence, the bronze fork at the top of the Pesh-en-kef plausibly represents the Hyades of Taurus rather than the horns of Aries as Miller’s book suggests. (See diagram.) Perhaps the ram priests of a later age also wielded this ritual artifact first used in the Age of the Bull. At any rate, the Taurean symbology of Egypt and the American Southwest is consistent. Returning to the latter, we see that the Grand Canyon, while evoking the immensities of deep space, is also related to both the subterranean spirit world beyond death and the source of all life. The eastern end of the canyon corresponds celestially to the left arm of Orion, whereas its western end encompasses the Hyades cluster of Taurus. The specific morphological correlation between the mongko and the constellation Taurus with its V-shaped end pouring out rain stresses again the ceremonial link between earth and sky. The mongko is thus invested with the sacred power of both canyon and constellation. *Taurus achieved its maximum altitude at midnight due south of an observer in circa A.D. 1100, when the Hopi settled on their three Mesas, which I have identified elsewhere as the belt of Orion. See my magazine articles in Atlantis Rising, Jan./Feb. 2003, Issue 37, and in Ancient American, Vol. 7, No. 46. **A kachina is an intercessory spirit that can manifest itself in form of any object in the universe. Part of the annual ceremonial cycle, the day-long kachina dances held in the village plaza feature masked men who actually become a particular spirit rather than merely impersonating it. Because this is a territory of nomadic rather than sedentary habitation, no pueblo ruins exist, though petroglyph sites suggest the stars of this constellation in its mundane manifestation. 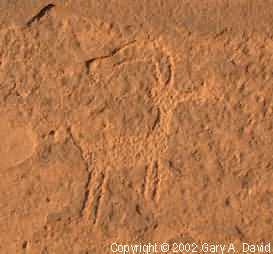 In fact, petroglyphic evidence of the Ram abounds in this region. According to David S. Whitley, one of the foremost experts on North American prehistoric art and a professor of archaeology at UCLA, the Coso Range just south of Death Valley National Monument is... "One of the most spectacular concentrations of rock art sites in North America--if not the world..." [David S. Whitley, A Guide to Rock Art in Southern California and Southern Nevada] Along this thirty mile stretch of canyon located within the boundaries of the China Lake Naval Weapons Center, over 14,000 pecked rock drawings are known to exist. Dr. Whitley claims to have found over 350 engravings of bighorn sheep alone, which he estimates to be between 1,000 and 1,500 years old. Whitley believes that this plethora of sheep petroglyphs formed part of a shamanistic ritual system to induce rainfall. Many so-called hunting blinds constructed from piles of rocks have been found together with bighorn sheep bones near springs in the Death Valley region, especially on its eastern side. In ancient cosmological thinking, springs represent not only essential life-giving oases in the desert but also portals leading to the spirit world. In addition, a number of serpentine rock alignments and circles have been discovered in this area, possibly corresponding to water and the underworld. The existence of at least one documented bighorn sheep petroglyph (but probably more) in Titus Canyon in the Grapevine Mountains attests to the fact that the Bighorn Shaman’s powers to control weather was needed throughout the entire Great Basin. Although hunting of mountain sheep undoubtedly occurred, more likely the emphasis was on their supernatural attributes connected with water. In this context we are reminded of the Hopi Al (Two Horn) Society, the members of which wear the involuted horns of the mountain sheep on their heads. This fraternity directs the November New Fire Ceremony (mentioned in Part 1 of this essay), which is thought to have developed from the annual Shoshonean pinyon pine-nut harvest festival and concurrent mourning ritual. Various clans migrating southeast from the Great Basin also brought the idea of fixing this festival’s date according to the position of Orion and the Pleiades in the night sky. The Hopi language gradually distinguished itself from the other members of its Uto-Aztecan linguistic family about three millennia ago. "The linguistic evidence indicates that the forebears of the Hopi separated from their Numic congeners, and ‘came out’ of the Great Basin around 1,000 B.C..." [Richard Maitland Bradfield, An Interpretation of Hopi Culture] This date is squarely in the middle of the Age of Aries. The early shamanistic tradition of associating mountain sheep with rainfall is carried on in the Pong (Pang), or bighorn sheep kachina, which in particular has the power to make rain as well as to cure spasms. The Hopi word for the sacred bighorn sheep is pangwu, or pa’ngwu. Breaking up this word, we find that pa (paa) denotes "water," but it also has the sense of "wonder, awe, surprise," etc. The suffix ngwu means "causing to occur." Thus, pa’ngwu literally means "causing water (or in the desert, ‘wonder’) to occur," which points to the mountain sheep’s shamanistic potentiality. The Egyptian word ba means "ram," and its anagram ab means "horn" (of an animal). The homophones of this anagram mean "soul" and "heart" respectively. Since no "b" sound exists in Hopi language, "p" is the closest phonetic approximation. Thus, the same root word is used in both Egyptian and Hopi to refer to the ram. Especially in Thebes, the people worshipped the great ram-headed deity Amon (Amun or Amen), also known as the "king of the gods" and thereby equated with the Greek Zeus. The Hopi constellation named Soo’ala literally means "star-horn," but the word ala (or aala) specifically designates the Two Horn Society. Soo’ala very possibly could refer to Aries, which traditionally represents the Ram. The word soo’ala also refers to a cat’s cradle figure, whose angle of strings could be likened to the constellation’s angled ram’s horn. However, as with the case of the Gemini Twins, Aries does not resemble a ram or ram’s head in particular, but only symbolically so. Surprisingly, the Egyptian near homophone aail means "horned animal." Is this yet another example of cross-cultural influence? At least one African tribe from the Congo region (unfortunately not designated) worshipped Ala, "...a Supreme Spirit of the Sky, a Jove, whose voice is thunder, who gives or withholds the rain, and whose hand hurls the lightning." [E. A. Wallis Budge, Osiris & the Egyptian Resurrection] These meteorological attributes are all in keeping with pangwu, from which the Hopi Ala society derives its power. Of course, we need not be reminded of the name of the supreme god of Islam. To cite another example, the Hopi word ari (as in Ari-es) means shearing sheep, or cutting hair. Before the introduction of domestic sheep, did some sort of hunting and ritual "shearing" of mountain sheep exist? This is not to say that the Egyptian ram was not revered in earlier times. In fact, the ram-headed Khnemu (or Khnum) was one of the oldest divinities. He was associated with primeval water, the inundation of the Nile, and fertility. The name of this creator god means "to mold" or "to model," and he is sometimes depicted as seated at a potter’s wheel fashioning humans out of clay. However, another ram-headed deity named Harsaphes (or Herishef) gained ascendancy during the First Intermediate Period (c. 2150 - 2050 BC, near the beginning of the Age of Aries). Like Khnemu, he too carries a scepter* and an ankh; but unlike Khnemu, Harsaphes wears the atef. This crown consisted of a pair of ram horns and sometimes a solar disk combined with two upright ostrich plumes. 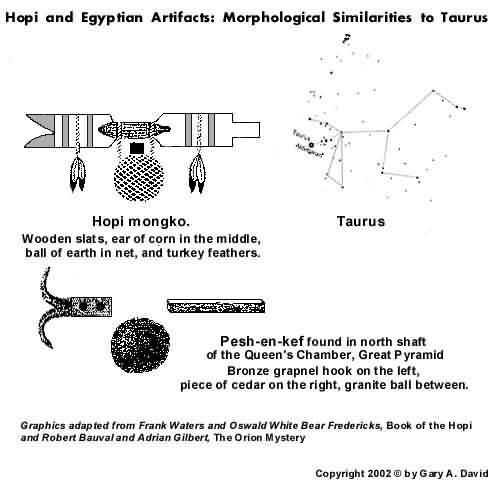 We can see that the atef is morphologically similar to both the "V" of the Hyades (Taurus) and the Hopi mongko. (Refer to diagram in Part 1 of this essay.) The atef crown was traditionally worn by Osiris (Orion, the constellation adjacent to Taurus). Another depiction of Harsaphes at his temple in Heracleopolis near the Faiyum shows the atef together with the solar disk inside a pair of cow horns. This indicates that the bovine (in particular, the celestial Bull) has fused with the Ram. It is possibly more than just a coincidence that the Hopi word haru (as in Harsaphes) means "bent," "crooked," or "hooked," whereas the related Hopi term heesi (similar to Herishef) means "horn shape" or "cornucopia." Was this, then, the mixed iconography of the transition from Taurus to Aries spread globally? Is this the reason that the Hopi Two Horn priests wearing the curved horns of the Ram carry the mongko, which is shaped like constellation of the Bull? Although both constellations were in some way associated with water, the precessional shifting from Taurus to the Aries was reflected in a change in cultural and religious symbology, a gradual process lasting centuries. Perhaps the dilemma is only apparent to our modern consciousness obsessed with nomenclature. One wonders, however, what the combined imagery of the Fish and the Water Bearer will resemble. *The was scepter, a symbol of divine authority, somewhat resembles the form of the mongko, mentioned in Part 1, "A Dilemma of Horns." Another word for the was scepter is tcham. In sound and sense, this, coincidentally, is very much like the Hopi term tsaama, which means "to lead" or "to take them along."